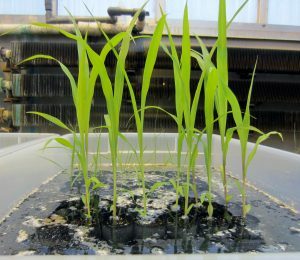 We will field-test three top performing new strains of switchgrass and other warm-season grasses in a multi-state coordinated trial network, and generate a robust, machine learning-based predictive model simulating yield, environmental and economic performance, and the likelihood of attaining the desired price point of <$3/gge over a gradient of soil marginality. By collecting and linking new and ongoing, consistent empirical data streams from 18 statistically rigorous, geographically distributed field trials, we will fill critical knowledge gaps and address uncertainties that are currently limiting our understanding of the potential for sustainable, high yielding, and dependable new energy feedstock supply from marginal land. Our predictive analytics will encompass agronomic, ecosystem, logistical, and techno-economic parameters, will provide a feedback loop to basic research by identifying priority areas for system improvement and further cost effectiveness to facilitate adoption. 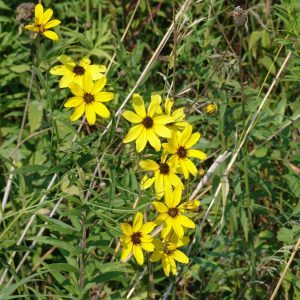 Perennial-plant buffers designed for multifunctionality offer opportunities to bridge crop production and ecosystem services in agricultural watersheds. The goal of this project is to evaluate the field nutrient loss reduction capacity, ecosystem services, and adaptability to farmers of perennial buffer strips of selected mixtures. We hypothesize that perennial cropping systems (e.g., bioenergy and forage) will be most effective in removing nitrogen and phosphorus from the soil over time and reducing early and late-season nitrate leaching when annual crops are not actively growing. Moreover, perennial cropping system will have a significant positive contribution to soil C sequestration and reduction of soil greenhouse gas emission. Perennial energy crops grown on degraded and/or marginal lands that are not suitable for conventional crop production have great potential to augment bioenergy output while improving sustainability of integrated agricultural production systems, including water quality and economic benefits. 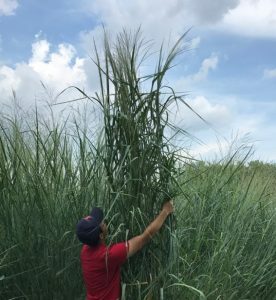 Selecting the right species and cultivars that produce economically profitable biomass on marginal lands is the necessary first step. 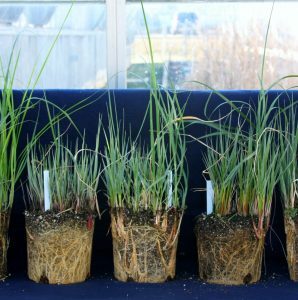 Our long-term goal is to develop prairie cordgrass (Spartina pectinata) as a dedicated energy crop for sustainable feedstock production on marginal lands associated with seasonal flooding and soil salinity, while improving water quality. This project focuses on implementation of a logistics system and biomass production on the Illinois Department of Transportation (IDOT) right-of-ways. Our lab is working with IDOT to explore production of energy crops on right-of-ways to help generate revenue through biofuel products and offset road maintenance costs. 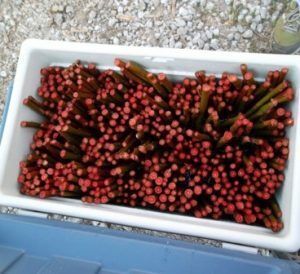 This research looks at the integration of strategically placed short rotation shrub willow into an agricultural landscape and its resulting ecosystem service provisions. Argonne and the University of Illinois are collaborating to extend a current research project funded by the USDOE to include a biodiversity component as well as to continue field research using the monitoring methodologies established in previous years for a second coppicing cycle. 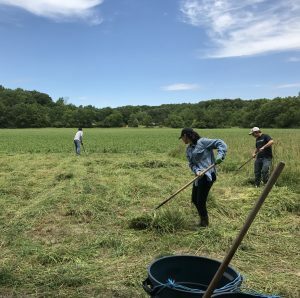 Also, Argonne is interested in replicating the research methods to monitor impacts of different bioenergy crops at one or more additional field sites. Currently, abiotic stresses contribute to reducing food crop value by up to approximately 50%. Such abiotic stresses include saline soils, temperature, and water availability. 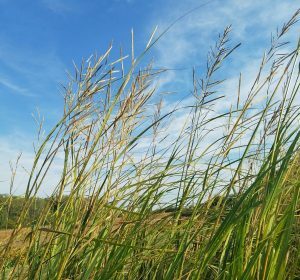 Native perennial energy grasses have proven to be tolerant to some of these stressors. Our research is focused on understanding the transcriptome dynamics involved in stress-tolerance gene functions and phenotypes that result from a GxE interaction. Once we understand these mechanisms, we can then utilize this knowledge in order to maximize the productivity of marginal crop lands. Reduction of nutrient runoff from agriculture production systems is a key concern facing the ag industry. The overall goal of this study was to determine the best management practices for sustainable biomass production of perennial energy crops on marginal land while improving ecosystem services. Emphasis was placed on significant removal of nitrogen, phosphorus, and potassium, with the intent of reducing nutrient leaching into waterways. From this study, we inferred there is considerable potential for perennial energy crops to remove excess nutrients when grown on a riparian buffer; however, a specific recommendation for species selection and best management practices including N fertilization and harvest timing will be dependent on the desired outcome for either biomass or forage production.